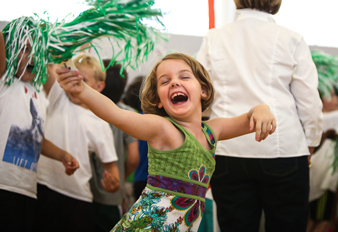 Most Durham Academy Upper School and Middle School classrooms were empty for much of the second week of school, but, out in the great classroom of the world, students learned some of the most important lessons of the year. On annual experiential education trips for grades five to 12, students expanded their comfort zones, bonded with their classmates and teachers, and discovered new things about themselves. These trips — taking students to destinations as far away as Alabama, to the North Carolina mountains and even a weather-dictated “staycation” in Durham — are part of the experiential education program that is a hallmark of the DA experience. The fifth-graders’ experience at Camp Hanes, a 400-acre outdoor education center at the base of Sauratown Mountain, marks their first overnight school trip and the beginning of DA’s eight-year outdoor education program. Goals of the two-day/one-night trip include helping students develop leadership skills; offering opportunities for students to get to know one another and their teachers in new and different ways; helping new students become comfortable with their new school, teachers and classmates; and fostering cooperative group learning, social responsibility and healthy lifestyles through outdoor recreation and activities. Activities included team-building exercises, hiking, primitive survival skills, a water zipline and canoeing. 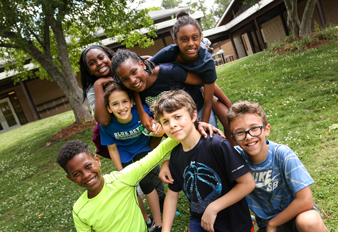 Sixth-graders spent three days at Camp Cheerio in the Blue Ridge Mountains, where the goal was to create new friendships, renew relationships with old friends, get to know their teachers and increase their self-confidence by overcoming mental and physical obstacles. Activities included hiking at Stone Mountain, team-building exercises such as a group obstacle course, canoeing and a ropes course. 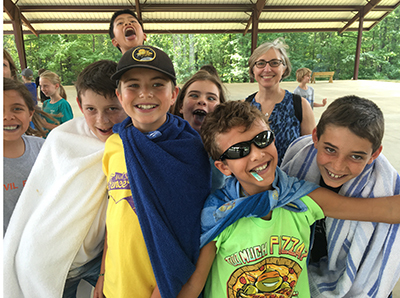 Seventh-graders typically kick off the year with a day trip to Falls Lake, but Tropical Storm Hermine’s rain necessitated a change of plans — instead, a “staycation” in Durham that, according to students, was a blast, nonetheless. 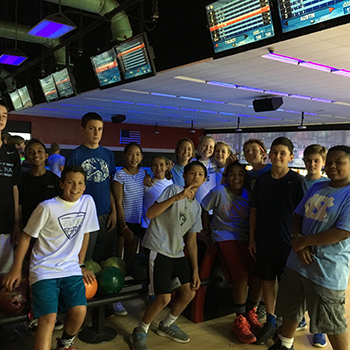 Students kicked off the day by presenting skits based on their summer reading book, “The Revealers,” then took advantage of having the Middle School campus to themselves with a pizza party, and wrapped up the day with a few rounds of bowling at AMF Durham Lanes. 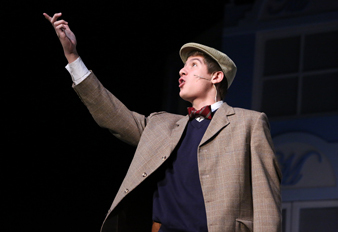 “I loved the skits — they were really funny,” seventh-grader Meghan Tarpey said. 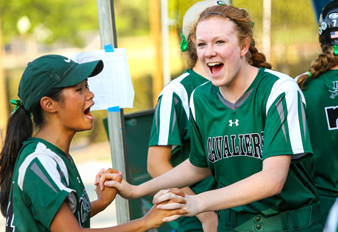 “And the bowling was awesome,” added classmate Carly Baker. 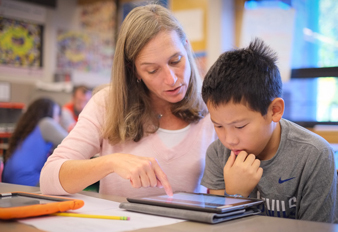 The seventh grade class’s marquee trip of the year takes place in February, when students will spend three days in Washington, D.C., bringing their study of American history to life. The eighth grade’s three-day trip to the Mountain Trail Outdoor School at Camp Kanuga uses the outdoors to teach and inspire students to care for the environment around them. 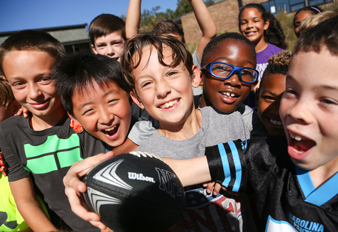 In February, eighth-graders travel to the North Carolina coast. This experience initiates the eighth grade’s study of coastal and barrier island habitats, and helps foster deeper friendships as students prepare for Upper School. 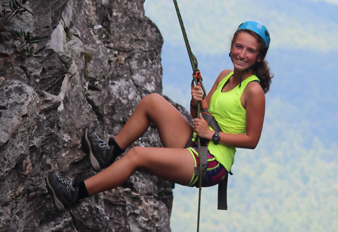 "Camp Kanuga was really fun,” said Madison Haller, an eighth-grader who is new to DA this year. “It gave me a chance to get to know people and meet some friends." Ninth-graders spent four days at Green River Preserve, a 3,400-acre land preserve near Brevard. The trip’s focus was learning to co-exist and work with nature, with education about mountain ecosystems provided by trained naturalists. Students learned primitive crafts and skills, such as making fire with sticks and identifying edible and medicinal plants, and hiked nearby trails with plenty of stops to learn about native flora and fauna. The sophomore class’s four-day trip to High Rocks near Brevard aimed to help students to gain an appreciation for group problem-solving dynamics and develop respect and sensitivity for fellow classmates. The trip also served as a preparation for the Senior Challenge journey that they will experience in two years, with education about basic compass and topographical map-reading and controlled rock-climbing. 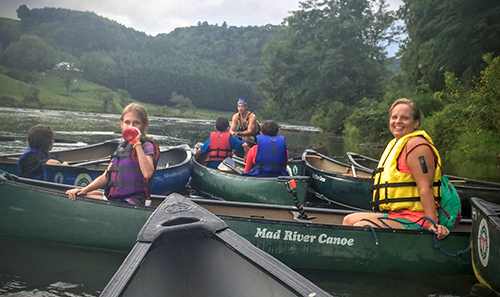 Students had plenty of time with their advisories, with whom they camped each evening in the Dupont State Forest and Pisgah National Forest. 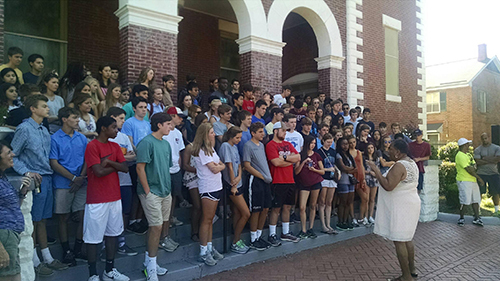 While most class trips are outdoor education experiences, the junior class Civil Rights Tour is a worthy departure. For four days, students met with foot soldiers of the Civil Rights movement in Greensboro, Atlanta, Montgomery, Selma and Birmingham to have the experience of history that can best happen by standing in the places where it was made. A few highlights of this year’s trip included meeting with Dr. Bernice King — daughter of Dr. Martin Luther King Jr. and CEO of the King Center in Atlanta — and visiting 16th Street Baptist Church, the International Civil Rights Center and Museum, the Rosa Parks Museum, the Civil Rights Memorial Center and the Equal Justice Initiative. Because this was a more emotional than physical experience, students met in advisory groups for nightly debriefing and reflection sessions. 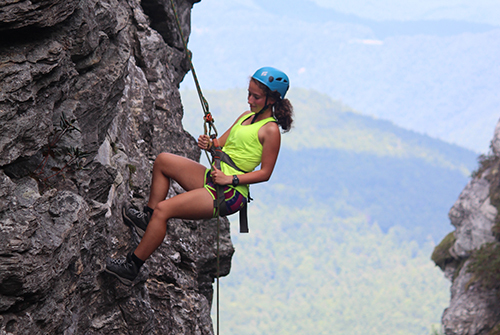 Since the fall of 1979, DA’s outdoor education program has culminated with Senior Challenge, a wilderness adventure in the North Carolina mountains that challenges students physically and emotionally to help them better understand and appreciate who they are, what they are capable of and what responsibility to self and others entails. 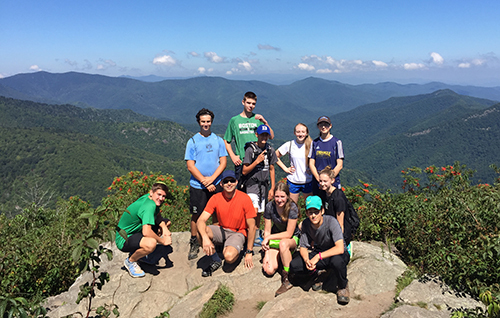 On the six-day/five-night trip, some seniors hiked and camped in the shadows of the Black Mountains near Mt. Mitchell, while others journeyed through the Linville Gorge Wilderness Area. Led by wilderness experts from Black Mountain Expeditions, students were responsible for carrying everything they needed for the trip in backpacks, navigating trails, preparing their own food and setting up camp each evening. In addition to the thrill of summiting multiple peaks over the course of the trip, each group had the opportunity to rappel a cliff — with one group doing so in a waterfall. “Senior Challenge showed me how beautiful the North Carolina forests are,” senior Victor Harpe said. “It was a pleasant introduction to backpacking and camping. While the majority of seniors participated in Senior Challenge, a few students instead participated in an alternative senior experience — a hybrid outdoor education-service experience including serving breakfast and sorting clothing at Urban Ministries of Durham, weeding sweet potato beds and corralling chickens at Funny Girl Farm, and hiking along Chapel Hill’s Morgan Creek. View more photos from the grades 5 to 11 trips at https://flic.kr/s/aHskJcReTF, and view photos from Senior Challenge at https://flic.kr/s/aHskGwFizN.